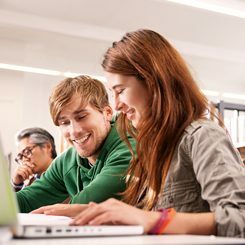 The TestDaF is a language exam that determines whether candidates possess the language skills required to be authorized to study at a German university or institution of higher education. It is mainly intended for students and those interested in studying but also provides internationally recognized evidence that your knowledge of German is sufficient to complete scientific projects and enter academic professions. The TestDaF classifies participants’ language skills at the fourth/fifth level of competence (i.e. B2 and C1) laid down in the Common European Framework of Reference for Languages (CEFR). In order to take the exam, your knowledge of German should be at least equivalent to competence level B2. You can register to take the TestDaF exam once you have a sufficient knowledge of German. Before taking the TestDaF exam, we recommend that you make yourself familiar with its contents. The best way of doing this is to attend the preparatory courses run by the Goethe-Institut or other test centers or to participate in the online preparatory course run by the Goethe-Institut. These courses enable you to become acquainted with the format of the exam and how it works.